OK, I'm cheating today but I've been feeling pretty rank for the last few days and for once clothes are the last thing on my mind. So instead I'm giving you the chance to win this beautiful girls dress from The Disney Vintage Collection. Handmade in the UK, Snow White fans will love the classic cotton dress with a beautiful vintage style print and a huge oversized bow. The dress that I have to give away is an age 8. 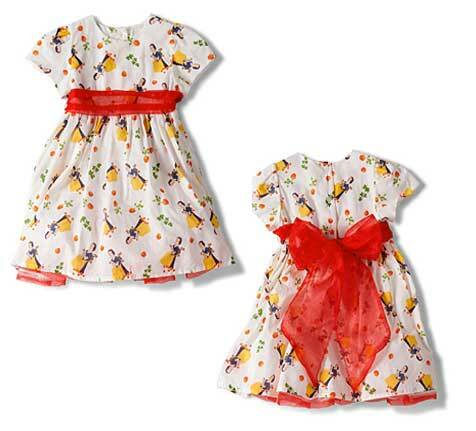 It will be perfect for a little girl aged from 6 to 8. Disney Vintage Kit Dress is £85 exclusively from Selfridges. The giveaway ends on 20/12/11, if the winner responds with their details by return the dress will be posted on 21/12/11 and should arrive in time for Christmas. The dress is gorgeous! I'm only having Blondie Boy in dresses though if he asks specifically though so will pass. Feel better you! Omg I feel the need to win this for my cousin whose got a little girl with blonde hair but is styled just like Snow White! 7 dwarfs. What an absolutely gorgeous dress! there are 7 and this is gorge. my melly has a kit vintage alice skirt i found in a sale somewhere. 7 dwarves, and that dress is just gorgeous! Pixie saw this dress on Monday when we went to see Santa in Selfridges (amazing experience BTW) but even I coudn't justify the price tag so to win this for her would be wonderful!!! 7 dwarves. This dress is beautiful! Hi, There were seven dwarfs. (Is't it funny how dwarf and dwarves always look like they are spelt incorrectly, or is it just me? I always think the same of scarf and acarves!). Kind regards. There were SEVEN dwarfs ... this dress is very cute! my granddaughter would look beautiful in this! snow white had SEVEN dwarves as companions! Lovely dress , my daughter would love it. There were seven dwarves. There were seven dwarves. What an adorable dress!